It's a trend that's taken a troop of chimpanzees by storm: a blade of grass dangling from an ear. The "grass-in-ear behavior," as scientists have termed it, seems to be one of the first times that chimpanzees have created a tradition with no discernible purpose -- a primate fashion statement, in other words. There's no doubt that chimpanzees have culture, as different chimp groups will use unique tools: to groom, to crack open nuts, to fish for termites. 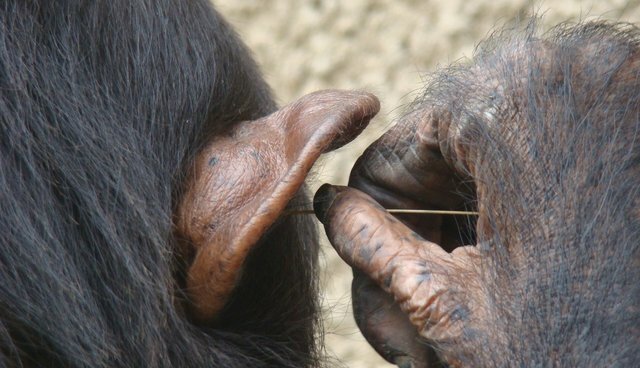 But, according to a study in the journal Animal Cognition, chimpanzee culture now includes something that seems altogether arbitrary: ear accoutrements. "Our observation is quite unique in the sense that nothing seems to be communicated by it," says study author Edwin van Leeuwen, a primate expert at the Max Planck Institute in The Netherlands. To figure out if this was really a tradition, and not just chimpanzees sticking grass in their ears at random, van Leeuwen and his colleagues spent a year observing four chimp groups in Chimfunshi Wildlife Orphanage Trust, a sanctuary in Zambia. 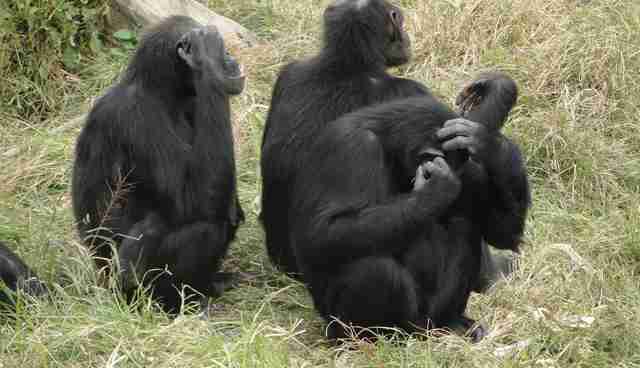 Only one troop performed the grass-in-ear behavior, although all of the chimps lived in the same grassy territory. There's no genetic or ecological factors, the scientists believe, that would account for this behavior -- only culture. Lydia Luncz, a primatologist at the Max Planck Institute in Leipzig, Germany, who was not involved with the research, agrees. This study shows how the chimpanzees who learned to put grass in their ears did so through the "natural transmission" of new behavior, she says. The cultural quirk first popped up in 2010 when a chimpanzee, named Julie, was spotted sporting a long-stemmed piece of grass. 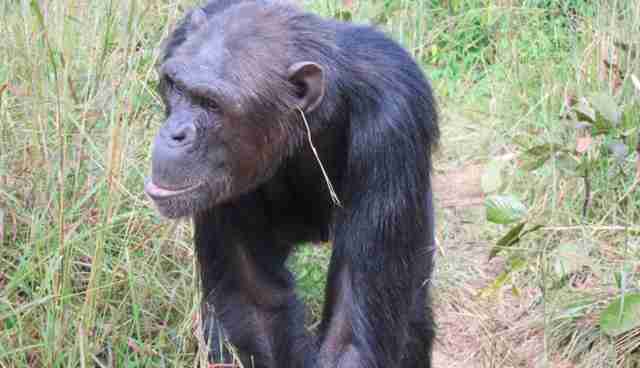 Julie acted as a role model for the other 11 chimpanzees in her group. As van Leeuwen points out, "everybody can wear rings in their ears, but you just have to come to the idea to do it." 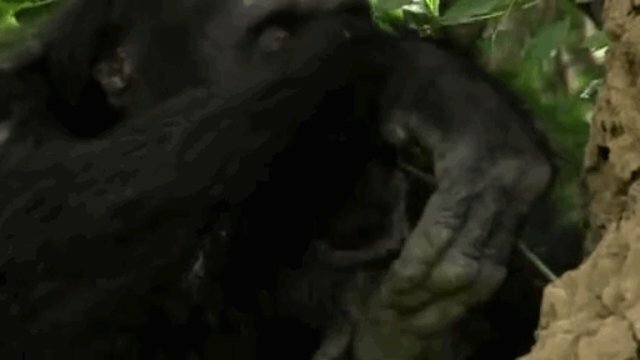 The seven chimps who adopted the grass-in-ear tradition -- and who would continue it after Julie's death -- repeatedly inspected her behavior before trying it themselves. "The chimps would pick a piece of grass, sometimes fiddle around with it as to make the piece more to their liking, and not until then try and stick it in their ear with one hand," van Leeuwen says. "Most of the time, the chimps let the grass hanging out of their ear during subsequent behavior like grooming and playing, sometimes for quite prolonged times. As you can imagine, this looks pretty funny." As silly as it may seem to us, the grass-in-ear behavior isn't far removed from a human fad. "Any kind of subculture fad in human culture, I'd say, could be the parallel to this grass-in-ear behavior," van Leeuwen says. "Perhaps wearing earrings or certain kinds of hats."